The Enraged Polar Bear is a hostile mob found exclusively on EMC. Its release was part of the second phase of the Survival Updates. This mob is a faster, stronger, and rarer version of the normal Polar Bear mob. 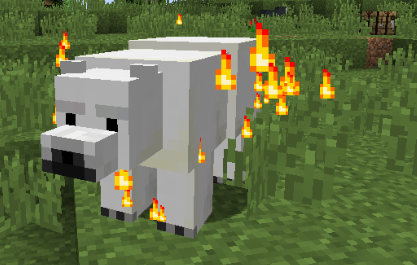 Its fire particle effect distinguishes it from normal Polar Bears. They will also charge at you without you having to agitate them first, unless you're under playing below difficulty 3. Its Shiny Fur drop is used to make Padded Fur, which can be used to craft Padded Fur Armor.